Google, is the world's most used search engine, Google, it started in 1996, but Google is not so popular in the early days. As it is today that Google is one of the world's largest companies, many of Google's products are very popular, of which YouTube and Gmail are most indirect. 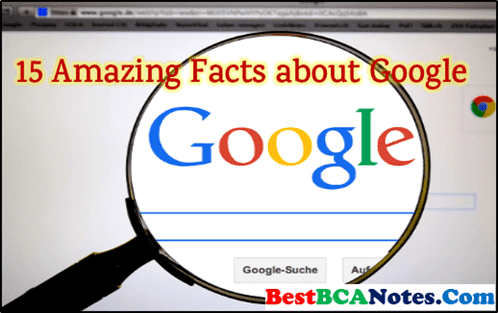 In this post we will discuss about interesting facts about google. 1. More than 20,000 people per week apply for jobs in Google. 2. In 2005 Google acquired the Android Company. Today, Android platform-powered devices are being purchased the most. 3. Google started in 1996, i.e. currently Google has been 21 years old. 4. In 2006, Google bought the online video sharing site YouTube. Up to 60 hours of video are uploaded to YouTube every minute.Over 6 billion hours of video are watched on Google's video service YouTube. 5. Google earns about 90 percent from the ads. Google's main advertising platform is AdSense & Admob. 6. The name "Google" was caused by a mistake in spelling. Google's founder wanted to name "Googol" but due to the mistake of writing spelling "Googol" became "Google". 7. Gmail started on April Fools i.e. on 1st April. 9. Initially, Google founder did not know much about HTML (Hyper Text Markup Language) which is essential for web designing and designing). 10. Google was run by Larry Page and Sergey Brin, two students of Stanford University, California for a research project. 11. On Google every year 2095 million search is done, i.e. more than 60,000 searches are done on Google per second. 12. Google’s search engine is 100 million gigabytes! A terabyte of one terabyte will be required to save as much data as you can! 13. By uploading Android App to Google Play Store, we can also earn from it. 14. Google operates 70+ offices in more than 40+ countries. 15. Google's headquarters in Mountain View, California.California, is referred to as Googleplex, which is a logical argument on GooglePlex's English word Googlepllex and word complex, the headquarters itself is a complex of buildings. So if you like the information given about Google, please share it.